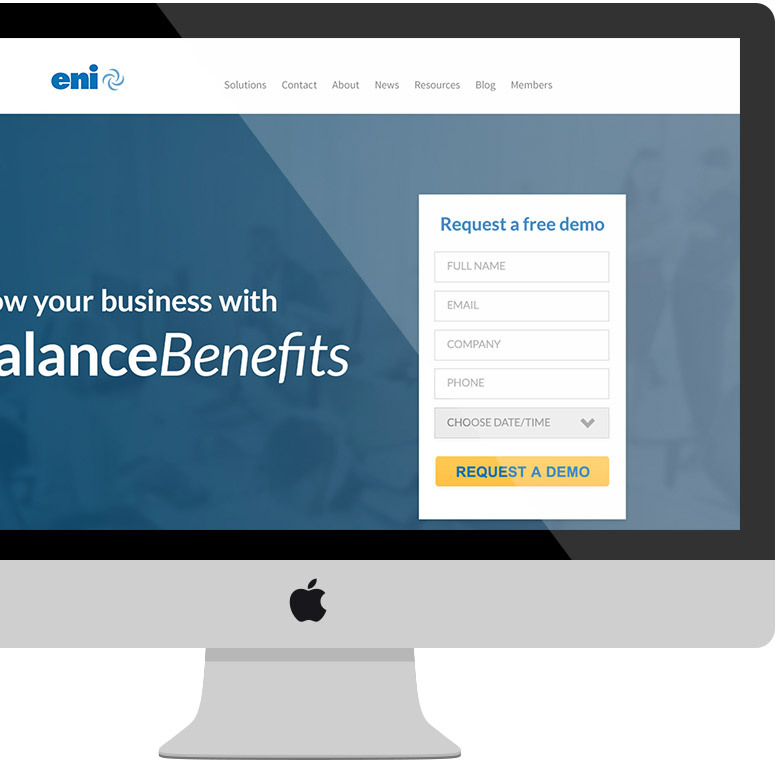 eni, an industry-leading employee benefits provider, helps connect employees to their benefits. This gives them a deeper understanding of benefit management solutions, resulting in increased employee engagement, satisfaction, and retention as well as improved ROI on benefit offering. While the offerings and products offered by eni were of the highest caliber, their presence felt dated. Idea Kraft took the essence of the look but evolved it to reflect the modernity of eni’s brand’s offerings. One of the biggest challenges with their old site was that it was confusing, with so many calls to action that each one lost its value. The lack of hierarchy gave mixed messages and made it harder to build trust with prospects. Before beginning the design for the new website, wireframes and sitemaps were created to create the best hierarchy of information, and explore the best way to depict the information and move forward. From color-coding the solutions to giving hierarchy to their main takeaway, to clearer calls to action, we told a story in a much more understandable way. Design that meets the user on a personal level is much more effective in generating leads and nurturing long-term relationships. In addition to creating a new website, Idea Kraft was hired to overhaul marketing materials, and digital strategy with the specific goal of increasing qualified leads. The dated website, email templates, and methods were leading to a lower response rate from prospect lists and were contributing to a slow overall growth of the new product line. For this project, Salesforce was used to track all prospects, leads, and qualifications, becoming the launch pad for marketing communications. Tactics included email campaigns to new prospects and existing customers, targeted digital ads through social media channels, organic social media growth through content creation, and industry public relations. 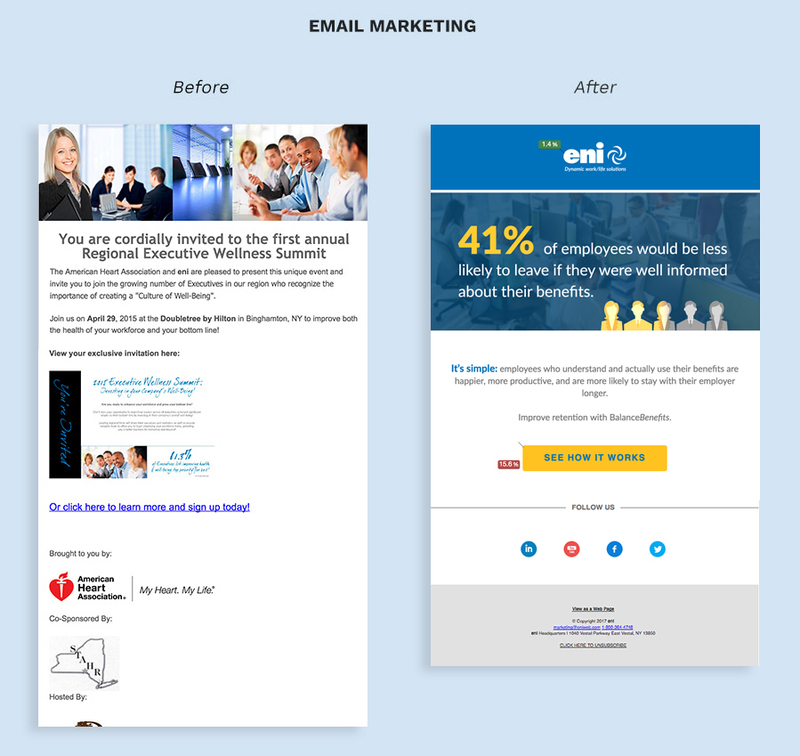 Landing pages were created for eni’s three target audiences: Human Resources, Brokers, and Executives. Updating the corporate site and landing pages allowed us to improve the experience on the back-end, to track correctly now. Everything is integrated seamlessly with Pardot, so that the client can use their marketing automation software for what it has to offer. Before, they weren’t really utilizing any of its features, besides the very basic lists. By fixing all of this, we provided high, long-lasting value for them internally as well. To further round out the brand, Idea Kraft helped eni with their print marketing materials. A variety of sellsheets were updated to create a robust library for eni to use to enhance their marketing efforts. A focused effort was made to improve typography, use less corporate looking photos, and streamline copy to create a captivating experience that is easy to understand and visually appealing. 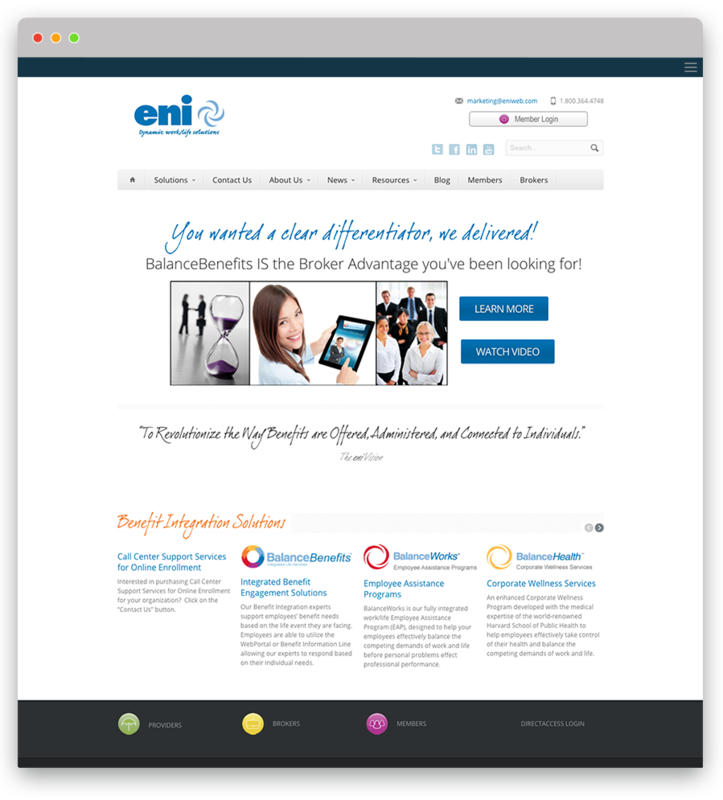 A full library of custom icons was created to further enhance the line of products and services that eni offers.